Victoria Shelby (hands up in the back) enjoys Friendsgiving with some Texas A & M Aggie friends. Whoop! 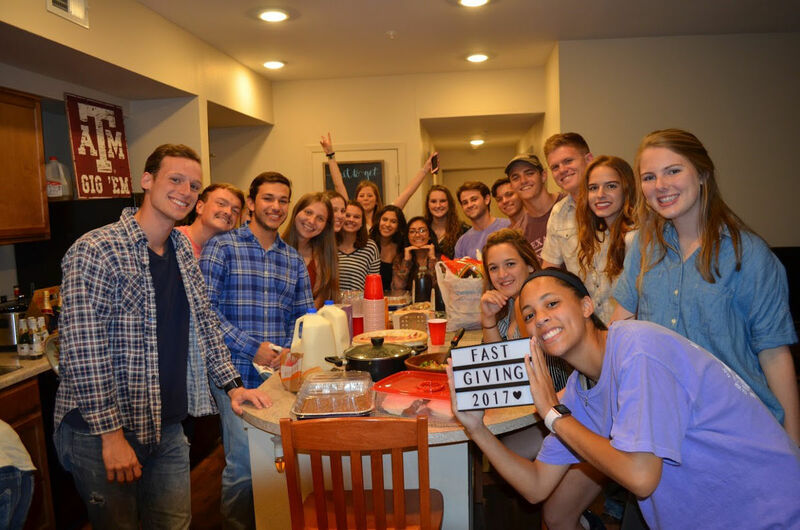 They called it FAST-Giving since their group is Freshmen Aggies Spreading Tradition (FAST). The concept of Friendsgiving first came across my radar on Facebook a few years ago when my friend Suzanne Shelby posted pictures of her teenage daughter, Victoria, then a St. Agnes student, attending one such gathering. Now a veteran Friendsgiving celebrator, Victoria is currently a sophomore at Texas A& M and continues enjoying Friendsgivings with her college friends Freshman Aggies Spreading Tradition (F.A.S.T.) family. 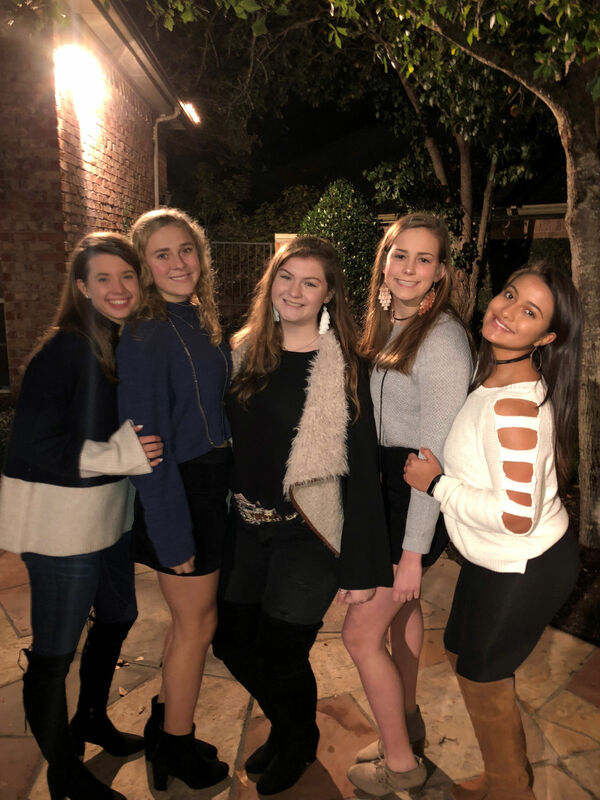 Victoria’s 16-year-old sister, Abigail, is also a Friendsgiving fan and this year her St. Agnes and Strake Jesuit group decided to make their favorite thing for dinner…reservations. They enjoyed their Friendsgiving at BRIO Tuscan Grille. 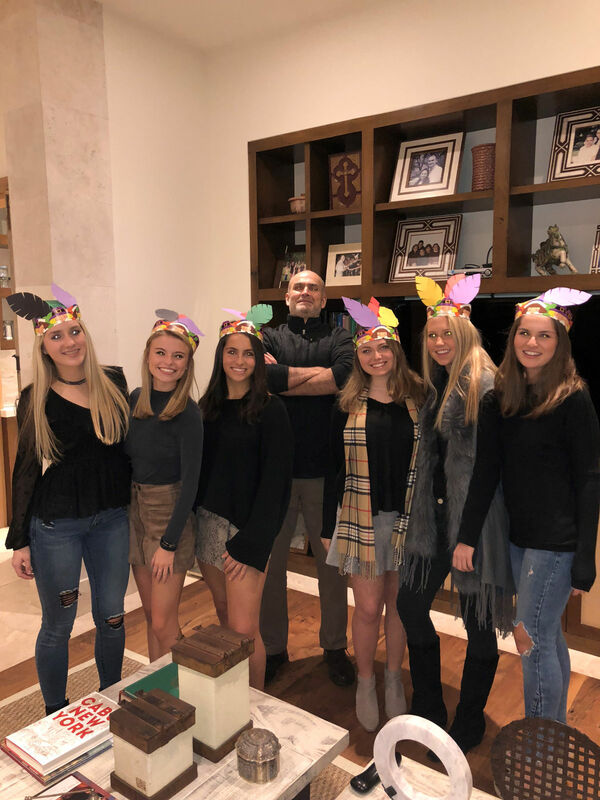 These St. Agnes juniors are having fun turkeying around with their Chef Tellez (aka Maria's dad). Pictured (from left) are Mary Margaret Williamson, Addie Hoss, Audrey Leonard, Alfredo Tellez, Kate Logan, Annika Torning, Maria Tellez. So here’s a special November service announcement for boy moms like me who use social media. Quickly look away if you spot those sweet perfect photo op girl faces beaming at you and don’t even start reading the cute details or comments. (One girl made a special trip to Trader Joe’s to get vegan cheese for her vegetarian Friendsgiving guest. So sweet.). Last year I kept seeing Friendsgiving posts on Facebook. I was captured by their spell. I tried repeating my usual “I got to be a football team mom” and “We only have to pay for the rehearsal dinner” mantra I use whenever I’m tempted to throw a “I don’t have a daughter” pity party.” It wasn’t strong enough. I was too weak. I started thinking, maybe, just maybe I could encourage my high school son and his friends to host their own Friendsgiving. He said thanks, but no thanks. Are you sure? Yes, mom. I’m sure. I take deep breaths. I tell myself no. I scroll quickly by any Facebook Friendsgiving pictures. Then, it happened. A Friendsgiving miracle. The next day, our son and his friends are hanging out somewhere. He’s entered the “some friends can drive us” years, so we’re never quite sure where they are. He calls to say they’re going to grab some lunch. I suddenly have the great revelation to throw a surprise Friendsgiving for the boys! I tell him, “Save your money. Come to our house. We have food Mr. Fell brought us.” Can’t you always lure teenage boys with free food? The answer is always a capital Y-E-S! He says they’re headed over. I spring into action. I set the dining room table for six…with real dishes, real glasses and real silverware. I light a few candles. (I had gone crazy!) I start heating up food. The boys arrive. “What is all this?” they ask. “Happy Friendsgiving!” I yell giddily. There are four of them. Our son, his two classmates and one of their cousins. They look at each other and start laughing. They wash their hands and sit at the table. 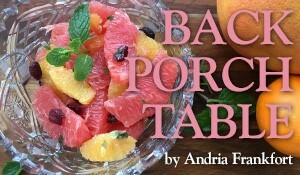 We recruit my husband from watching television in the den to fill the sixth seat at the table. So far so good. Then our son announces, “Mom, we need to leave in 15 minutes. We had already promised Joe’s grandma we would help move her refrigerator.” I ask them to call grandma and give me another half hour. Crisis averted. I keep microwaving at warp speed. Finally, all the food is heated up and the platters are on the table. We say a prayer (we even hold hands!). It’s a dream Friendsgiving. My camera is standing by for the perfect photo. The food starts getting passed around. The “hasn’t said a peep cousin” suddenly asks if there are nuts in the food. I tell him, I’m sorry but I didn’t cook it so I’m not sure what’s in it. How about a piece of cheese? No, thanks. He’s lactose intolerant, too. I rack my brain and go get a carrot to throw on his plate (where’s the vegan cheese when you need it, right?!). Plates now piled high with food, everyone starts to dig in with anticipation. Things are looking good. Then the guys are looking at each other and snickering in teenage boy language. In my hurry to heat the food, I had forgotten the cardinal microwave rule. You need to stir in the middle of heating up. Only the outside was heated. The inside was cold. My husband wasn’t so silent. 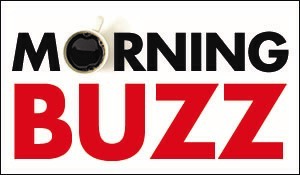 Surely, they’re overreacting. I try a bite. They’re actually dead right, that’s pretty cold. The boys say, thanks, Mrs. Fuller, but they really need to go move the grandma’s fridge. My son says, “I love you.” They leave, food still on their plates. (Why didn’t I use paper plates?!) Hubby goes back to the game on in the den. And not a single photo to document the whole 12-minute event. So there you have it. A little something we like to call the Un-Friendsgiving (thought it had a nicer ring to it than “The Worst Friendsgiving Ever”). 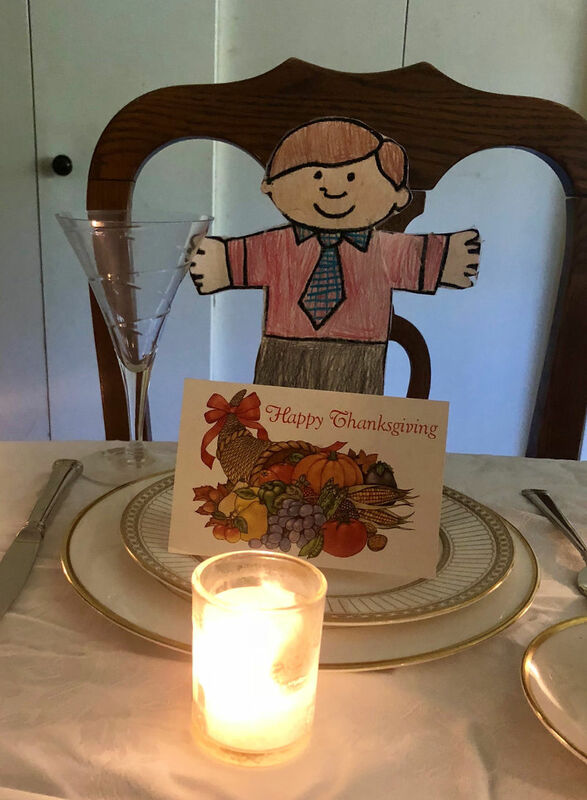 A Virginia native, Flat Stanley (designed by second grader Nora Gum) is thrilled to be visiting Houston enjoying his first Friendsgiving. This year I am embracing the adorable Friendsgiving posts and being thankful I can live vicariously through friends with daughters. I’m also happy to report that I had a lovely boy Friendsgiving experience this year. My niece, Nora Gum, a second grader in Virginia, sent Flat Stanley to spend Thanksgiving with us in Texas this year. Stanley sat at the table with me. He didn’t have anywhere else he had to be. He wanted to be at the dining room table and not the den. He didn’t care what temperature the food was and he didn’t have any food allergies. He didn’t squirm during the picture and he even wore a tie. What a guy!